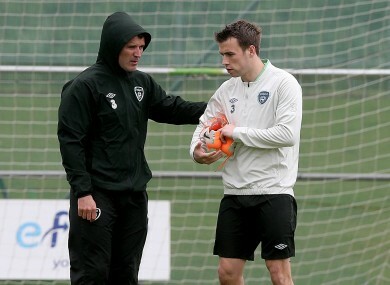 Roy Keane gives Ireland defender Seamus Coleman some directions. SKY TOUCHED DOWN at Croke Park with armchairs and pundits galore, Roy Keane played down links with the Celtic job, Mickey Harte was in foul humour, as were Yaya Touré and Rory McIlroy, and Louis Van Gaal was confirmed as Manchester United boss. It has been a busy sporting week but your excellent comments were certainly among the highlights. Here are some of your best observations. Willie Murphy came up with this song after news emerged of Diego Costa turning to horse placenta treatment to get fit for the Champions League. Oisín Daly was hoping Leeds midfielder Paul Green took up a strop similar to snubbed Man City dynamo Yaya Touré as he joined up with the Irish squad. Michael Cunningham believes the Class of 92 may be hard to shift at Old Trafford. As Australia gave TV viewers a run-down on GAA, Stiofan Hunter vgot in touch from an even more exotic location. Arsenal’s Jack Wilshere had a pop at rivals Spurs. Paul Moylan had not forgotten the midfielder’s call to chat with a critical Paul Scholes. The lights went out at the multi-million dollar Silverdome and Michael Ward bemoaned its closure. Arsenal Wenger bought himself some time at Arsenal after winning the FA Cup last Saturday. Joshua Walsh was in good spirits that evening. Paul Reid came up with a novel way of finishing football sticker albums. Email “Motown to Portumna and forgetting Paul Green's birthday: It's the week's best comments”. Feedback on “Motown to Portumna and forgetting Paul Green's birthday: It's the week's best comments”.